Love this set, added great color to the bedroom and the comforter has just enough weight to it that it's not too hot to sleep under. The sheets were not quite deep enough pockets but they will work and the material feels pretty good. Revitalize your bedroom decor with this bright and brilliant comforter set. Global inspired motifs with detailed hints of aqua blue, red, and orange bring a sizzling sense of style that your inner flower child is sure to love. The vibrant colors and unusual design make this comforter set one of my favorites. The comforter is not too heavy but it is still warm. I love the coordinated sheets, pillowcases, shams and pillows. I paired it with some aqua colored curtains for a really wonderful look! I am super pleased with this comforter set! I love my comforter set! I was surprised at the good quality and I would recommend this comforter! I purchased this set almost a year ago and the colors have not faded in the wash. Product is as described and looks great. Comforter, flat sheet, and fitted sheet all fit nicely on our deep mattress. One thing I do prefer are cotton sheets and these are not. So, sleeping under the sheets make for a hot night. But as mentioned before product is as described. I liked this comforter set. The colors are so vivid and bright. I like that there were 3 custom pillows to go with the set. I don't like that there is not more pillow shams to the set. I knew that there was only 2 shams per set but it would have been nice if the set came with 2 taller shams. The set was reasonably priced and I would recommend this product. I have had several comments on this set and I have only had it for 2 weeks. The product arrived in reasonable time. Great product. The colors are very vibrant and the extra decorative pillows add to the look. I have it in my guest bedroom. Very happy with it. Great price. This was a very nice set. The colors are just as shown. Looks very nice on my guest room bed. 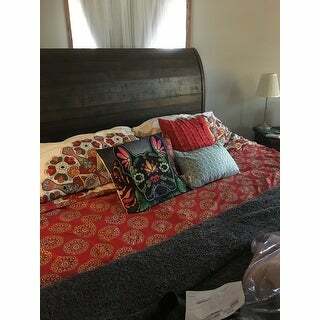 It is a nice quality fabric and seems very cozy, I would recommend this set to someone who wanted to brighten up a room and not have to pick pillows ect. Really beautiful design and color combo. Brightens the room and is super easy to coordinate with sheets and decor. Lots of compliments. Comforter is soft and warm. Holds up well to washing. I received my comforter set yesterday and I love it!! It lightens up my room the blue is the perfect shade of my walls and so comfortable!! My favorite comforter ever and after only one night!!! Now to find curtains- I wish Overstock sold matching curtains!! The red in the picture look darker , but it is bright red . Not sure how I feel about it . It’s beautiful, colors are bright. But it’s smaller, also it’s a noisy fabric. I am very satisfied with this comforter set. The material feels good and the cost was a deal considering what came with it. It was very wrinkled but the wrinkles came out easily when I used the iron. I also purchased this set for my daughter and we were both so excited at how beautiful it looks on her bed. Color and design was what we were looking for, and we got it with this set. Looks great on my gueen size bed. "what do the shams look like? are they the RED as shown on the RED side ? or are they the cream with the paisley print on them in the opposite picture? thanks!" The shams have reversible pattern. One side is printed with the red pattern, while the other side is printed with the cream with paisley pattern. "What size bed and comforter are shown in picture?" "Is the white a bright white or a cream white and is the red a bright red or a darker red? Difficult to tell from the photo." "what color are the sheets that come with this set?" Baby blue maybe a little darker than baby blue but close to it. "What is the thread count on the sheets? What kind material is the comforter?" "Does this come in twin size?" Unfortunately no, the twin size is not available at this time. Great colors! I wish it had a bed skirt but maybe it won’t be needed. Looking to add some color to bedroom, colors go with current paint and curtains in room. It’s so pretty, and comes with sheets and pillows! Love it.